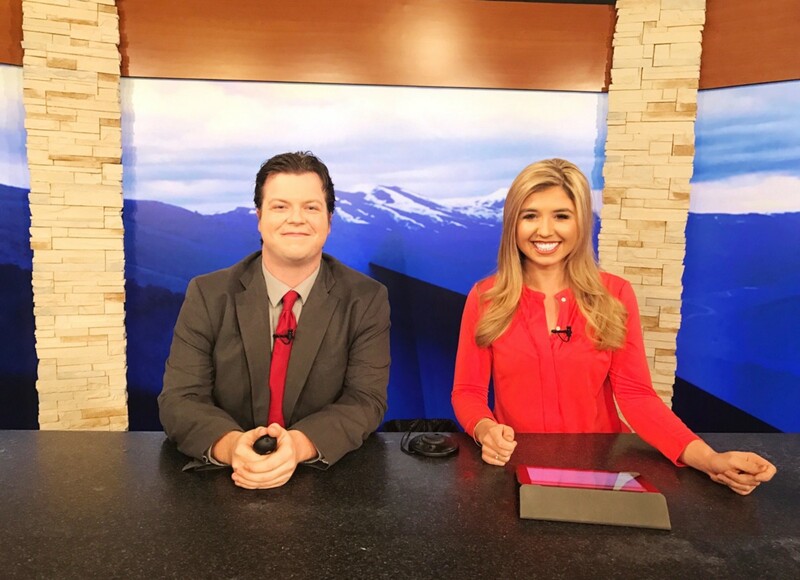 Conner Board (right) on the anchor desk for her show, KPVI News Today, weekdays at 6 AM. KPVI is in Pocatello, Idaho. Conner grew up in Reno and graduated from the Reynolds School of Journalism in May 2016. Q: Did you always want to go into broadcast in your undergraduate career? Conner Board: I did, I started college knowing that I wanted to do some type of media, but I wasn’t sure what aspect- like online or E news. I had an internship in Nashville for an online news publication that covered entertainment news and music news, so I wasn’t sure if I wanted to go that route. But as an anchor, you get exposed to everything. I never thought I’d be a producer, but I produce the whole morning show. Then I learned that I actually really liked it. Conner Board hosts an elementary school group at KPVI. Q: How has your journalism degree from the Reynolds School impacted your career? Conner Board: Having such a good broadcast journalism program, the Reynolds School helped me build up my resume a ton. You have to have a reel to apply to jobs and so I was a part of (student video shows) Wolf Pack What and the Brush Up, and these gave me the experience to make my reel. It’s also good that you are required to do an internship. They are so good for your resume and practice. With the Reynolds School I got to go to a national media convention my sophomore year, which exposed me to different ideas and careers. The Reynolds School is so good about being hands-on, and even classes, like ethics, really impacts how I think now. Especially as a producer in the morning, I am the only person there, and so when issues come up I am the only one who can make the decision. Conner Board reporting in the field for KPVI. Q: What are some of the most significant stories you’ve covered, or you’re most proud of? One story that I worked really hard on was that I really wanted to talk to inmates of the state women’s prison. I wanted to know how it was to be in prison while pregnant. I ended up calling a bunch of people and was able to get someone to talk to me. It is really hard to get in and talk face-to-face, but I was able to go through some loopholes and talk to a woman who had just had her baby in prison. I really like those kinds of stories- human interest. That’s the reason I got into journalism. I like to share people’s stories, because I think everyone can learn a lot from each other. Every Monday, Conner Board has a“Pet Place” segment showcasing a pet in need of adoption. Q: What’s the funniest or most interesting story you’ve worked on? Conner Board: There was one guy who played his guitar for three days straight, not sleeping at all, to raise money. I got to go interview him and it was funny because the whole interview he had to keep playing the guitar. Talking to me while playing, so that was a good memory. Conner reporting on a story about concealed carry gun laws in Idaho. Q: What are your aspirations for the future? Do you want to stay where you are? Conner Board: After my two-year contract, I do want to get into a bigger market. I would like to remain an anchor, but I am open to also being a full-time reporter. Every day I get to produce, anchor and report. I produce for the first three hours of the day, my show is an hour long, and then I end up doing a small story which goes into the night newscast. It’s a very busy schedule, but I love all the experience. And that means that my next job could be as a reporter, a producer or an anchor as I move up in the business. Q: What tips could you offer to undergraduate students at the Reynolds School? Conner Board: · The biggest thing is to get as much experience as possible. Whether that means going to speaker events … I know the Reynolds School is always bringing in really good speakers, or Q and A’s. Go listen and take in everything they have to say because that is going to help you in the long run. · Get hands-on experience and keep your options open. I didn’t know I was going to be a producer, so I didn’t pay much attention in the classes that would have helped me with that. Learn everything that you can while you are there, because if you work in a small market, you are going to have more than one role. Conner Board with morning meteorologist Nate Larsen and a baker who comes in once a month to make cakes on air. · Make connections with people. You can learn a lot from your fellow students. Be confident and don’t be intimidated. Sometimes it is hard to talk to people who can help you and, so don’t be afraid to ask for help if you don’t understand. Get out there! · Once you are close to graduation and start applying for jobs, don’t be afraid to take a chance and go somewhere new. Get that experience no matter where it is, it’s worth it. Enjoy your first two years, they will be a lot of hard work, but it will build your foundation to move up to a bigger market or a place where you want to work. · Take constructive criticism. You have to have a strong backbone in journalism because there are always going to be different opinions and views from your audience, but take everyone’s advice, even if you don’t agree with it, because you want everyone to be listening. Nearly every morning, Conner Board has a guest from the community. Idaho has a big hunting population, so every month she has the Department of Fish and Game on the show. Q: What advice could you give to someone who might be in your position, going to a new town you’ve never been to before? How were you able to get involved in the community? Conner Board: Get involved in community clubs, or church. Meet new people who are from there and find out what is important to your audience — then go on that. Try to meet as many sources as you can, and build relationships, because that is how you are going to get your stories. But you also can’t break that trust, so you have to report accurately. Photos provided by Conner Board.